If you are fond of Mingoville and of learning English in general then take your learning yet to another level – mobile phones. 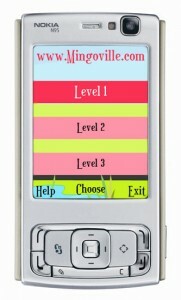 At Mingoville, we’ve built a mobile phone English learning application based on the famous Sudoku game. In the game, you will be playing and interacting with images from the Mingoville program as well as listening to the English pronunciation allowing you to improve your own comprehension skills. The game is designed to improve your English listening skills through the practice of listening and recognizing English words. The game has 3 levels and here are just few snapshots of the game in action. All you need to do is download the application and install it onto your mobile phone. See the installation instructions in your mobile phone manual yourself or with your parents. Download the Mingoville Sudoku Game HERE. Note: you have to check whether or not flash games are compatible with your phone. 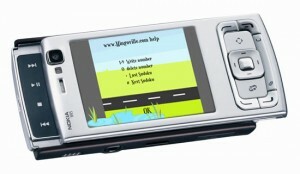 The game requires Flash Lite 1.0 (minimum). Have fun learning English with Mingoville. This entry was posted in Mingoville, News and tagged english children, mobile games, sudoku for kids by . Bookmark the permalink. the mobile it is very good . I want to learn english with help of ur site.